A late, deflected Mikel Arteta strike rescued a point for Everton at Sunderland in a game high on energy but short on quality. Everton enjoyed a perfect start as Tim Cahill headed his seventh goal of the season from a Leighton Baines cross. A Danny Welbeck brace either side of half-time - one smart near-post finish, one header - put the hosts 2-1 up. But Arteta's 20-yard left-foot strike flew in off Phil Bardsley before both sides missed late chances to win it. For Sunderland, returning top scorer Darren Bent fired into the side netting from inside the area and Welbeck curled a shot narrowly wide, but Everton's miss was far more glaring. In injury time, clean through 12 yards out and with only the advancing Craig Gordon to beat, Jermaine Beckford chose power when a deft touch would have done the job. And perhaps therein lies the difference between the sides. While the Black Cats can call on Bent, injured record signing Asamoah Gyan and the fast-emerging Welbeck to win them games, Everton have Louis Saha, Beckford and Yakubu with one league goal apiece this season. Going into the match on a run of only one league defeat in 11 matches and with half an eye on Europe and facing a team just a point clear of the relegation zone, Sunderland went in heavy favourites - and so of course fell behind early on. Both the goal they conceded and subsequent equaliser owed much to Everton's left-sided partnership. On five minutes and in the game's first meaningful attack, full-back Baines played a one-two with Steven Pienaar and, under no pressure, played in a perfect cross. Eight yards out and free of his nominal marker, Cahill had the simplest of tasks to head past Gordon. However, Pienaar and Baines were less impressive as Sunderland drew level. For all his invention, Pienaar was found lacking in the physical side of the game and he got turned far too easily by Bolo Zenden - himself hardly a behemoth of a man. The former Chelsea man then ran at Baines who perhaps retreated too far, allowing the winger to pick out an unmarked Welbeck from inside the penalty area for a neat finish. The equaliser was no more than the home side deserved for a period of dominance in possession and in the immediate aftermath of Welbeck's strike a second seemed likely, Richardson going close from 18 yards after Everton captain Phil Neville had lost the ball under pressure. That though was one of only four Sunderland efforts in the half and it was the visitors who came closest to going in ahead, Cahill seeing a header cleared off the line and Sylvain Distin firing over with Gordon out of position moments later. Overall, though, the first half was hugely forgettable, not least a complete non performance by lone striker Saha that left Everton without an attacking fulcrum. Initially the second half promised better as Sunderland's harrying led to a series of half chances, but the momentum was soon to subside and Everton had a chance of their own when Cahill ran on to a Neville chip and lifted the ball over the onrushing Gordon only to see Michael Turner clear off the line. And still quality was in short supply but amidst all the slips, missed passes and over hit crosses stood Welbeck. On his last appearance as a teenager, the on-loan Manchester United striker suggested that Sir Alex Ferguson's singling him out as a future England international was yet another shrewd piece of judgement. Before last weekend he had not scored in the Premier League in two years, he now has three in two games, his second on the night a well-directed header from a perfect Richardson cross. It took another 12 minutes for Saha to be withdrawn but on 81 minutes he left proceedings. Perhaps coincidentally, the equaliser came a minute later. Arteta, generally anonymous in a game where the ball spent little time on the floor in midfield, had time to turn 20 yards out and hit a low shot that took a heavy nick off Bardsley and flew past the wrong footed Gordon. Both sides then had chances to win it, but Beckford's lack of composure means Everton's sense of regret is likely to be the greater. "We started slowly against one of the league's better teams. "But we responded well and we are a bit aggrieved that we've conceded late on, it's a little frustrating. 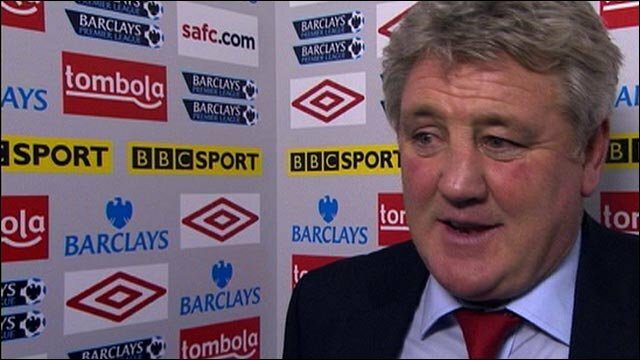 "Overall I think a draw was a fair result and we'd have taken 2-2." "We got into good positions but didn't make them pay. 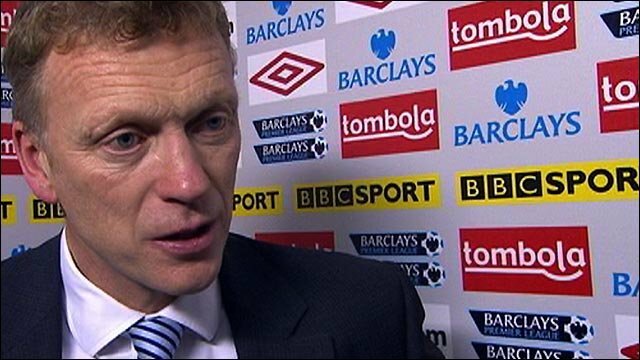 "It was disappointing we couldn't finish off our good play, but it's a hard place to come, Sunderland." "It was a great chance [for Jermaine Beckford at the end] and he normally finishes those off." 90:00+4:32 The match has reached full-time. 90:00+4:04 Effort on goal by Jermaine Beckford from just inside the box goes harmlessly over the target. 90:00+3:04 Shot by Danny Welbeck from deep inside the penalty area misses to the right of the target. 90:00+2:29 The official flags Jack Rodwell offside. Craig Gordon restarts play with the free kick. 90:00+2:21 Phil Neville delivers the ball, clearance by Anton Ferdinand. 90:00+1:33 Shot from just outside the area by Steed Malbranque goes over the bar. 89:24 Ayegbeni Yakubu is caught offside. Indirect free kick taken by Michael Turner. 86:00 Darren Bent produces a left-footed shot from deep inside the penalty area which goes wide of the left-hand post. 84:08 Substitution Ahmed Elmohamady joins the action as a substitute, replacing Jordan Henderson. 82:58 Leighton Baines provided the assist for the goal. 82:58 GOAL - Mikel Arteta:Sunderland 2 - 2 Everton Mikel Arteta scores a goal from inside the area high into the middle of the goal. Sunderland 2-2 Everton. 82:05 Substitution Johnny Heitinga leaves the field to be replaced by Jermaine Beckford. 81:37 Substitution Ayegbeni Yakubu is brought on as a substitute for Louis Saha. 80:33 Corner taken by Leighton Baines, clearance made by Michael Turner. 78:51 The referee blows for offside. Anton Ferdinand takes the free kick. 77:52 Leighton Baines sends in a cross. 76:38 Leighton Baines produces a cross, Michael Turner manages to make a clearance. 76:12 Leighton Baines crosses the ball, clearance by Anton Ferdinand. 75:35 A cross is delivered by Steven Pienaar, clearance by Michael Turner. 73:37 Free kick awarded for an unfair challenge on Phillip Bardsley by Jack Rodwell. The free kick is swung in right-footed by Jordan Henderson, save by Tim Howard. 73:37 Booking Jack Rodwell is given a yellow card. 72:42 Danny Welbeck takes a shot. Phil Neville manages to make a clearance. 72:26 Leighton Baines sends in a cross, clearance made by Michael Turner. 69:59 Kieran Richardson provided the assist for the goal. 69:59 GOAL - Danny Welbeck:Sunderland 2 - 1 Everton Danny Welbeck scores a headed goal from inside the box. Sunderland 2-1 Everton. 69:19 Darren Bent takes a shot. Blocked by Phil Jagielka. Inswinging corner taken by Kieran Richardson from the right by-line played to the near post. 68:18 Free kick awarded for an unfair challenge on Phil Jagielka by Kieran Richardson. Tim Howard restarts play with the free kick. 68:18 Substitution Steed Malbranque replaces Boudewijn Zenden. 66:10 Steven Pienaar takes a shot. Kieran Richardson gets a block in. Corner taken by Leighton Baines played to the near post, clearance made by Michael Turner. 65:29 Centre by Phillip Bardsley. 64:52 Substitution Seamus Coleman goes off and Jack Rodwell comes on. 63:24 The ball is delivered by Phil Neville, clearance by Jordan Henderson. 63:01 Leighton Baines sends in a cross, clearance by Anton Ferdinand. 61:58 The assistant referee signals for offside against Michael Turner. Tim Howard takes the indirect free kick. Correction - 61:14 Jordan Henderson takes a inswinging corner from the left by-line to the near post, clearance by Louis Saha. 61:14 Inswinging corner taken right-footed by Jordan Henderson played to the near post, clearance made by Sylvain Distin. 59:50 Handball decision goes against Phillip Bardsley. Mikel Arteta restarts play with the free kick. 56:33 Darren Bent is caught offside. Indirect free kick taken by Tim Howard. 55:50 Steven Pienaar has an effort at goal from outside the area missing to the wide right of the goal. 55:31 Mikel Arteta sends in a cross, Anton Ferdinand makes a clearance. 54:01 Tim Cahill takes a shot. Clearance by Michael Turner. 53:31 The ball is sent over by Seamus Coleman. 52:21 Steven Pienaar concedes a free kick for a foul on Nedum Onuoha. Michael Turner restarts play with the free kick. 49:27 Boudewijn Zenden takes a shot. Johnny Heitinga gets a block in. Corner taken right-footed by Jordan Henderson from the left by-line to the near post, clearance made by Sylvain Distin. 49:00 Danny Welbeck takes a shot. Save made by Tim Howard. 47:41 Kieran Richardson takes a shot. Save by Tim Howard. 46:21 Tim Cahill fouled by Nedum Onuoha, the ref awards a free kick. Sylvain Distin takes the direct free kick. 45:00+2:26 The ref blows to end the first period. 45:00+2:06 The ball is swung over by Phillip Bardsley, Header from deep inside the area by Darren Bent goes harmlessly over the crossbar. 45:00+1:37 Phil Neville delivers the ball, clearance made by Nedum Onuoha. 45:00+1:04 A cross is delivered by Leighton Baines, save by Craig Gordon. 43:49 Leighton Baines crosses the ball, clearance by Anton Ferdinand. 41:48 Boudewijn Zenden gives away a free kick for an unfair challenge on Steven Pienaar. Sylvain Distin takes the direct free kick. 40:43 Free kick awarded for a foul by Leighton Baines on Danny Welbeck. Boudewijn Zenden crosses the ball from the free kick left-footed from right wing, save by Tim Howard. 39:55 Unfair challenge on Nedum Onuoha by Steven Pienaar results in a free kick. Direct free kick taken by Craig Gordon. 37:59 Jordan Henderson sends in a cross. 36:01 Louis Saha takes a shot. Craig Gordon makes a save. 34:34 Inswinging corner taken by Leighton Baines from the right by-line. 33:56 Seamus Coleman takes a shot. Save made by Craig Gordon. 33:09 Shot from just outside the area by Sylvain Distin goes over the bar. 31:41 Outswinging corner taken left-footed by Leighton Baines played to the near post, Tim Cahill takes a shot. Jordan Henderson makes a clearance. 29:17 The assistant referee signals for offside against Tim Cahill. Craig Gordon restarts play with the free kick. 28:53 Unfair challenge on Louis Saha by Anton Ferdinand results in a free kick. Sylvain Distin takes the direct free kick. 26:32 Steven Pienaar takes a shot. Craig Gordon makes a save. 26:00 Effort from the edge of the box by Kieran Richardson goes wide of the right-hand upright. 24:06 The assistant referee flags for offside against Tim Cahill. Indirect free kick taken by Craig Gordon. 22:35 Boudewijn Zenden provided the assist for the goal. 22:35 GOAL - Danny Welbeck:Sunderland 1 - 1 Everton Danny Welbeck fires in a goal from inside the box to the bottom right corner of the goal. Sunderland 1-1 Everton. 17:41 Kieran Richardson produces a cross, Tim Howard makes a save. 17:10 Unfair challenge on Kieran Richardson by Johnny Heitinga results in a free kick. Direct free kick taken by Phillip Bardsley. 17:10 Booking Booking for Johnny Heitinga for unsporting behaviour. 15:49 Kieran Richardson crosses the ball, Steven Pienaar makes a clearance. 13:27 The ball is crossed by Jordan Henderson, save by Tim Howard. 10:51 Handball by Louis Saha. Strike on goal comes in from Jordan Henderson from the free kick, Tim Howard makes a save. 9:57 Unfair challenge on Danny Welbeck by Phil Neville results in a free kick. Kieran Richardson delivers the ball from the free kick left-footed from left wing, clearance made by Phil Jagielka. 8:31 Seamus Coleman challenges Kieran Richardson unfairly and gives away a free kick. Free kick crossed by Boudewijn Zenden, Sylvain Distin manages to make a clearance. 7:26 Unfair challenge on Mikel Arteta by Darren Bent results in a free kick. Direct free kick taken by Phil Jagielka. 5:18 Assist on the goal came from Leighton Baines. 5:18 GOAL - Tim Cahill:Sunderland 0 - 1 Everton Tim Cahill finds the net with a headed goal from inside the penalty box. Sunderland 0-1 Everton. 0:47 Corner from the right by-line taken by Boudewijn Zenden, Seamus Coleman manages to make a clearance.